Improve sports performance & get more from each workout! Citrulline is an amino acid produced from the combination of the amino acid ornithine & carbamoyl phosphate. Malate / Malic Acid is an organic compound used in food preservatives and contributes to the sour taste of green apples & other fruits. These are bound together to give them stability in the body. - Removes toxins in the body & lowers muscle fatigue by reducing Lactic Acid and Ammonia. - Increases ATP Production and Phosphocreatine Recovery, for reduced fatigue and more energy / faster muscle recovery. - Increased NO (Nitric Oxide) Production which regulates oxygen delivery, glucose uptake & blood flow. Giving you increased pump and muscle growth. - Not a Stimulant, so Citrulline Malate doesn't keep you up at night. It's very well known for its effectiveness and found in many pre-workouts available like The Curse, Mr Hyde & Superpump. For a powerful strength, energy, endurance & recovery combo stack Citrulline Malate with products like Beta Alanine, Creatine and Whey Protein. 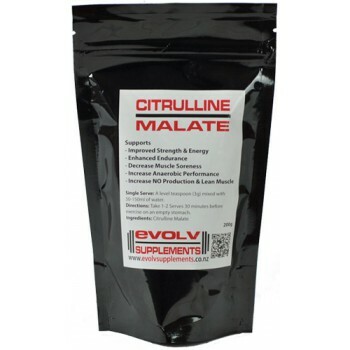 Citrulline Malate can help you build lean muscle, give you more energy & greater endurance. Helping you meet your goals faster and even burn fat at the same time. A level teaspoon (3g) mixed with 50-150ml of water. Take 1-2 Serves 30 minutes before exercise on an empty stomach.